Well you have no other trinket that will improve HPS so… It’s normal. The one you have is clearly bad for Mistweaver ^^’. Heh, this is a funny case that I’ve never seen before: like Sienss mentioned, you actually don’t have a second trinket that affects healing at all! @swol – Agreed and thanks for the response. Have a similar issue with it telling me to remove my chestpiece. Yours is a different issue. What’s happening here is that you have several items in your inventory that are higher item level, so for performance, we prune out lower item level stuff. But it appears that this pruning isn’t checking that you can’t actually equip the higher item level items. I’ll see if we can tweak that in the next update. In the meantime, keep in mind that the optimizer is really designed for max-level players. It should give an OK recommendation if you aren’t max level, but take it with a grain of salt. 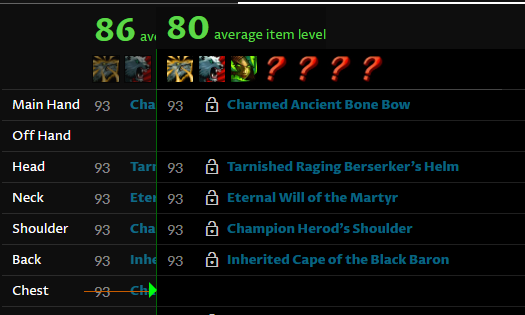 Really though… just putting on your highest item level item in each slot that has the appropriate primary stat for your spec is good enough (and usually optimal) until you get to the end game.